Congratulations! You have now survived your first few months as a mom. Most people say that the first few months after delivery are the worst! We agree too although if your baby has a health issue, is starting teething symptoms or not sleeping well, your challenges are far from over. On top of this, if you are breastfeeding, you may still be struggling with a lack of supply, engorgement or the round-the-clock pumping. Yes, we mommies truly are superheroes! The great news though is that as your baby gets older and keeps growing, they will continue to look cuter and cuter. That in itself may be worth it all. Your 3 to 6 month old baby will also be engaging with the toys that he or she ignored as a newborn. This makes your play time together much more interesting. Your baby will probably also start showing a preference for some toys over others. 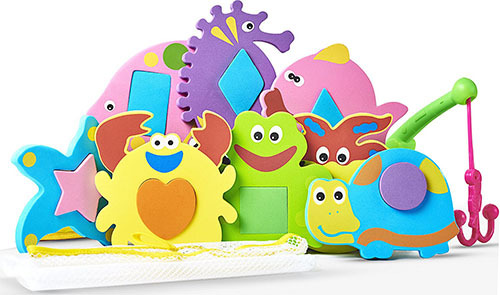 Here are our best 9 recommendations for toys for 3 to 6 month old babies. Remember we mentioned before that once babies can sit up, they may start to find ordinary play gyms less interesting because they can now reach the dangling toys too easily? Yet play gyms still have a role to play in supporting tummy time. Even if your baby can sit up, tummy time is still important for their next stage of development of crawling and walking. 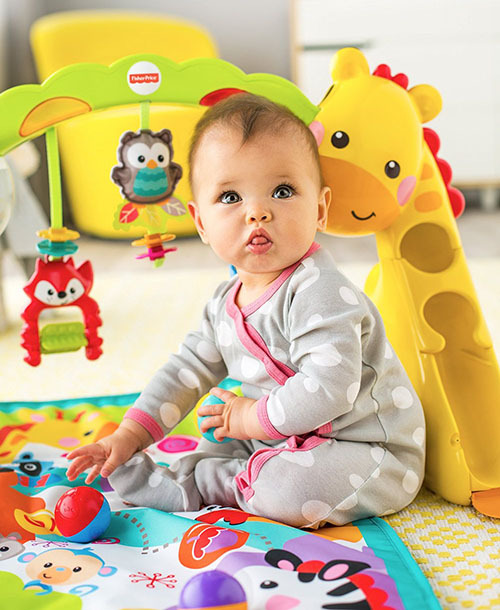 We like the Fisher-Price Newborn-to-Toddler Play Gym because it is something your baby can use from newborn to toddler age. It has the necessary colorful play mat, twinkling lights, music and dangling toys with a variety of textures to entice your newborn to go on tummy time. In addition, it has two cute animal slides (giraffe and zebra) on either side for balls that your baby can throw down the slide. These balls will help in promoting finger strength and dexterity. The play mat has pockets behind it that you can use to hold the balls during this play time. Although not necessarily recommended, this play gym’s slides will provide a better balance for your baby if she needs something to hold onto while sitting up. And finally, when your baby can finally stand up, she will be able to place balls in the top arch which act as a bridge for the balls to go from slide to slide. This will add another dimension of play for your baby. All in all, a great all-rounder play gym for a 3 to 6 month old baby! It can get pretty boring lying down all the time. Your baby can’t see much on her back and lying on her tummy gets tiring after a while. And we all know that when babies are unhappy or bored, they cry. We mentioned earlier that although jumperoos and exersaucers may seem perfect to help baby sit up, we don’t recommend it because it does not promote good development for their posture, balance and hips. Luckily for us mommies, there is an alternative to exersaucers and jumperoos; a floor seat. A floor seat doesn’t force your baby to stand on tiptoes or force her to carry a substantial amount of weight on her legs too early. Yet it allows her to sit up so that she can still see what is going on. It is not perfect but we think it is a good alternative to exersaucers and jumperoos if baby hates lying down. 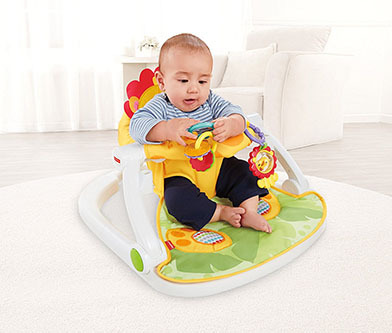 We like the Fisher-Price Sit-Me-Up Floor Seat with Tray. It has cute designs and comes with a snack tray that you can also use to place toys on. It comes with two foot pads that squeak when stepped on. Hanging off the side of the tray is a lion rattle with teether and sliding clacker rings. On top of this, it folds away nicely and is great for travel. So don’t buy a jumperoo or exersaucer and if you have one, stop using them! Instead get a floor seat. The Vertbaudet Jumbo Flower Rug provides a comfy place for your baby to explore and learn to use her fingers. 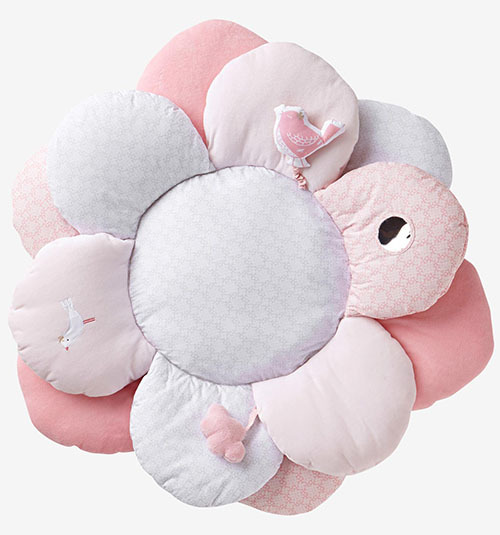 Shaped like a flower, your baby will find hidden treasures inside the flower including sounds and interesting textures. We like it because it encourages your baby to use her fingers to explore. It also is designed to reward her sense of curiosity. 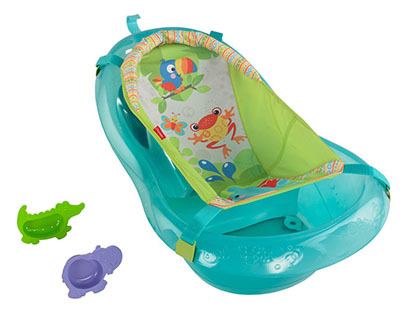 It can be used for supervised tummy time or once your baby can sit up, let her do all the exploration herself. In soft pastels, it will be a great addition to any room. The only downside is if you have a boy and mind the soft pink. Otherwise, fantastic for your baby! Cloud b is well-known for making useful gadgets to promote sleep that double-up as toys. Unless your baby is a natural sleeper, most babies need white noise playing in the background to help them sleep. And considering that sleep-deprivation is the number one complaint from most parents, you will love white noise. White noise is a sound that is similar to the sound that your little one hears while in the womb (that’s right, it’s not silent in the womb). It sounds similar to a radio left on a non-active channel or a shower. Your little one spent many months getting used to sleeping with that noise in your womb so white noise is useful in helping them sleep once they are birthed. Another reason for using white noise is that it can mask other sounds around them such as talking noises, the opening and closing or doors and general movement around them. A 1990 study found that 80% of the 40 newborns studied were able to fall asleep after 5 minutes of white noise being played. However, there is one huge precaution you should take when buying a toy that produces white noise. The American Academy of Pediatrics (AAP) recommends that you do not exceed 50 decibels in order to prevent hearing loss to babies, especially if you intend to play them all night long. So our recommendation is that you test the noise level of any white noise toy that you buy to make sure that it is safe for your baby. You can easily do this by searching for an app that you can download to your smartphone (for example, the Decibel 10th app). As a general idea, the sound should not be louder than a soft shower or conversation. 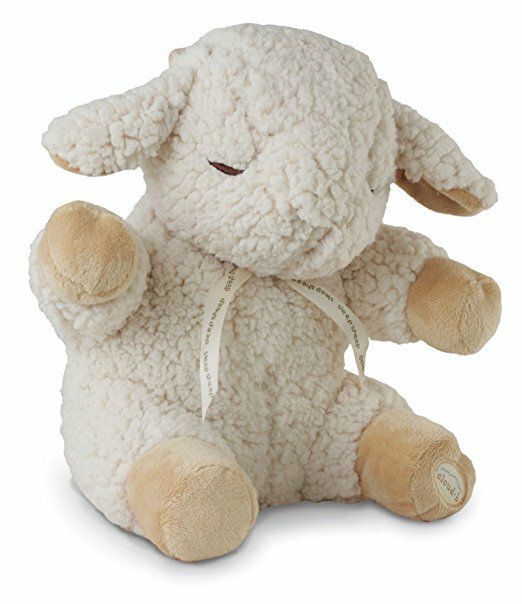 Bearing in mind this precaution, we recommend that you get the Cloud b Sound Machine Soother, Sleep Sheep with an adjustable volume. It is cute, cuddly and travel-size. The small size is especially useful if you need to help your baby sleep in a stroller or car seat or just simply in a new crib. More importantly, you can adjust the volume for as loud or soft as appropriate, bearing in mind the distance the toy is placed away from your baby. It has 4 soothing sounds; a gentle stream, spring showers, ocean waves and whale sounds. The sounds automatically tune out after 23 minutes or 45 minutes. We prefer if it had an option to be on continual play all night long but all the toy sound machines we checked seemed to turn off automatically after a while, probably because they were designed to be battery-saving. Alternatively, you can purchase a sound machine that runs on a power plug rather than batteries and these can run all night long. Bath time with baby is so much easier when you have a great bath tub to use. Choose something that is small enough that they won’t need you to hold onto them all the time and preferably can support them sitting up. Otherwise, you may find that you need two people around every time the baby needs a shower- one to hold onto the baby and the other to soap and rinse the baby. We like the Fisher-Price Bath Tub, Rainforest Friends because it can be used with your baby from newborn to toddler age. Although you should never leave your baby unsupervised or alone in the bath, this bath tub is small enough that they can remain sitting up in it while you reach for the soap or towel. There is a hippo pouring cup, an alligator sifter as well as a colorful sling. It comes with a handy plug at the bottom to make it easy for you to get rid of water in the bath once you are done. Thumbs up for great bath times! Bath time will be a lot more fun now that your baby is older. With the ability to use her fingers to grasp at toys and a budding sense of humor, your baby will enjoy having bath toys. However, beware that not all bath toys are created equal. Although they are fun, toys that squirt water will eventually grow mold inside of them. This is why we recommend the Baby Loovi Educational Foam Geometrical Figures instead. It comes with a mesh organizer bag that allows you to hang the figures dry and keep your bathroom tidy. There are 16 figures in the set made up of an interesting display of shapes, animals and colors. The figures are non-toxic as well. Guaranteed to keep your baby entertained as well as clean! The VTech Busy Learners Activity Cube will not only keep your baby’s attention for a good amount of time, it is great for her development! It has 5 sides full of different shapes, activities and colors including 4 button lights that play animal sounds. We love this toy because it will encourage curiosity in your baby, develop her problem-solving skills and grow her motor skills. It also comes with 25 songs for you to sing along to. Your baby always loves hearing you sing, even if you don’t sound like Beyonce. We also love this toy because of its size- it is great for a baby who is doing tummy time or sitting up. Has your baby ever tried to bother you while you were working on your computer and laptop? Did you wish you could give her something to distract her? 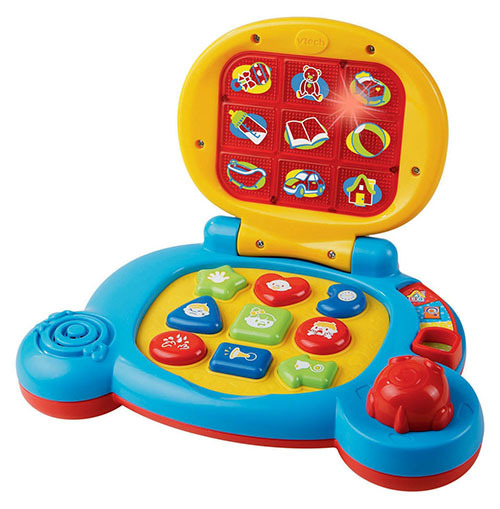 Well, try the VTech Baby’s Learning Laptop! A cute laptop with keyboard keys, light up screen and moveable mouse. When buttons are touched, it plays 90 songs that you can sing to and also speaks words. It is a nice travel size that your baby will find easy to play with whether lying on her tummy or sitting up. We think this toy is a good way to teach your baby about the fun of computers! And how cute if both mom and baby are working on their own laptops at the same time! As mentioned earlier, your baby may start showing signs of teething. If so, you will love this maracas toy. 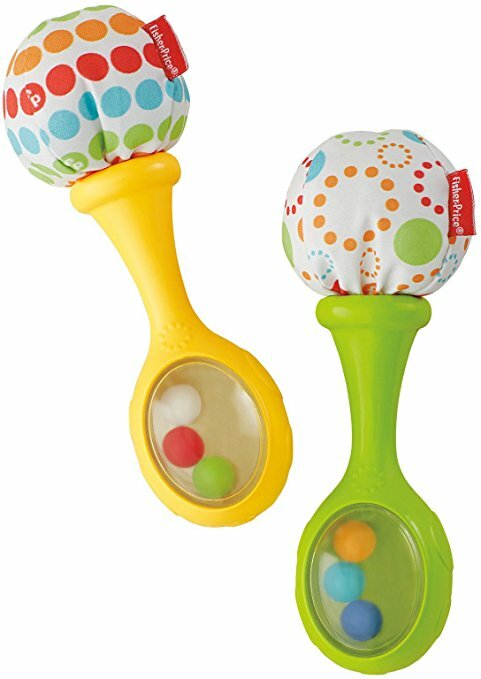 Not only does it have a soft cloth end (pom poms) that baby will love chewing on but it is great for small hands and comes with a nice rattle sound. Our test baby absolutely enjoyed thrashing the maracas around in her hands. Simple and yet for some reason, so loved by many babies. At 3 months, your baby’s eyesight will continue to lengthen in distance and she will notice objects that are further away. She will pay more attention to dangling toys and enjoy looking at them. If lying on her back, she will attempt to swipe at those dangling toys. She is also now strong enough to lift her head and chest while on tummy time. Tummy time is still extremely important to help her continue to develop her muscles. Her fingers are gaining in strength and she will also be able to hold toys with tiny diameters in her hands for a short period of time. She will start to appreciate the different textures in toys and will intentionally reach out and touch things around her. Her legs are also gaining in strength and she will still enjoy kicking a lot. Your baby may also have started showing signs of teething, even if the tooth is nowhere in sight. That’s right, your precious baby can start experiencing pains of teething for months and months before the little sucker decides to pop out. For you as a mommy, that spells months and months of nightmare. Some babies don’t complain about teething but some scream, cry, refuse to sleep and refuse food too when they are experiencing teething pains. Our test baby is definitely not a happy baby when she is teething and we may be delivering a post in the future about the best toys for teething pains. Because of this, we highly recommend that you consider using white noise (if you are not yet using this) to help your baby sleep better at night. At 4 months, your baby will be able to push up higher on her elbows and hands during tummy time. She would also have rolled over at least once, if not on purpose, then by accident. Some babies only do this for a few times and not on a consistent basis. To encourage her to keep practicing her rolling, you should give her something to lie on with sufficient space and padding. Ensure that you keep an eye on her, especially if you place her on a lifted surface like a bed. In addition, your baby will probably be able to start sitting up with your help. She will need you to hold onto her though as her balance will not be very good. She can also shake toys and is learning how to let go of them too. She will be putting a lot of toys in her mouth as a way of exploration. This means it is important that your toys are safe for her to lick or gum. At 5 months, your baby will be doing mini-pushups while on her tummy. Tummy time during this phase is still extremely important for further muscle development. She still needs your help to sit up but she may be able to stay up for a decent amount of time on her own. She may know how to use her legs and arms as a tripod to steady herself. Be careful that she may still lose her balance and suddenly fall backward. If she’s trying to reach for a toy in front or to her side, she may also suddenly end up on her belly. So it’s important to be watchful even when she seems fine sitting up. However, now that she can sit up and play, she will be able to reach all the dangling toys that she previously struggled with reaching. Because of this, she may start to lose interest in them as she can now get at them too easily. Once babies are strong enough to sit up and hold their head steady, you will notice that jumperoos and exersaucers are very popular among moms. This is especially for keeping babies engaged while mommies get some chores done. We completely agree that they are very effective for the purpose of giving mommies a break. Unfortunately, because of the high risks of hip deformity and other developmental issues that they may cause to babies, we will not be recommending those here. However, we will be recommending other alternatives that allow you to place babysitting up but with no unnatural stress on important parts of their body. For example, we recommend toys that allow both you and your baby to play together. Your baby will also enjoy toys that give them some sense of significance such as toys with buttons that they can press to play sounds or lights. We hope you find this list helpful for your next baby shopping spree! Let us know if you have any other favorite toys for your 3 to 6 month old!